This recipe was given to me many years ago by a former neighbor who was also from my home state -- Maine! I have been using it over the years ever since and it has become a regular on my holiday dessert table. Cream together the sugar, butter, eggs and vanilla until well mixed. In a separate bowl, stir together the flour, baking soda, baking powder and salt. Mix together, alternating dry and creamed ingredients until thoroughly blended. Cover dough and chill for about a half hour; then roll it out on a board, using more flour for desired consistency. 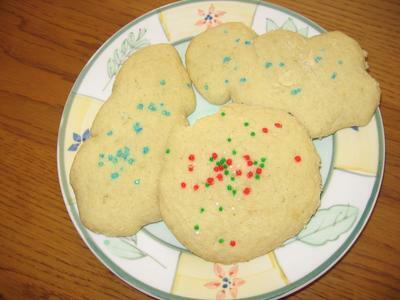 Cut with cookie cutters and sprinkle with colored sugars, if desired. Bake at 350F degrees for approximately 10 minutes; or until done.